North Carolina is home to many beautiful places and is an excellent place to live, especially if you are interested in the Waxhaw, Weddington, or Marvin communities. Located 12 miles south of Charlotte’s city limits, the Waxhaw area has a population of over 14,000 residents. Waxhaw’s population has tripled since the 1990’s. A big draw are the excellent public schools that serve the Waxhaw area. Waxhaw is named after the Waxhaw Indians, who were part of the Sioux tribe. Today, you can learn about the Waxhaw Indians at the Museum of the Waxhaws. Waxhaw is home to several other museums, including the Museum of the Alphabet and the Mexico Cardenas Museum. Waxhaw is also famous for being the birthplace of President Andrew Jackson. Historic downtown Waxhaw is home to many community events, including the Waxhaw Farmers Market, the Spring Kaleidoscope Fest, the Holiday Festival of Lights and Christmas Parade, the Waxhaw Independence Day celebration which includes a parade, fireworks, and beach party which attracts over 12,000 visitors. June through August, there’s music at the “Jammin’ by the Tracks” every Friday evening. Outdoor enthusiasts have numerous choices in Waxhaw, including Cane Park, Harvey Nesbit Park, Town Creek Park, David G Barnes Children’s Park, and the Waxhaw Sk8 Park for skateboarding enthusiast. The Andrew Jackson State Park on the South Carolina border is also close to this area. The Town of Weddington consists almost entirely of single-family homes on lots of one acre or more. At one time Weddington was considered the “heart of horse country” in Union County with a median home cost that is amongst the highest in the Charlotte area. Weddington is also home to Optimist Park, a 52 acre-facility with softball, baseball, soccer, lacrosse and football fields, and basketball court. One of Weddington’s prettiest landmarks is its Victorian Town Hall, the historic Thomas Wrenn house built in 1894, This landmark location sits at the corner of Hwy 84 and Providence Road adjacent to Weddington’s only commercial center, Weddington Corners Shopping Center. This commercial center houses a grocery store, offices, and other shops/small businesses. Considered the third wealthiest town in NC per the 2010 census, the median income of Weddington households is approximately twice that of both the Charlotte metro region and the State of North Carolina. The Village of Marvin is home to approximately 6,700 residents. Marvin is considered an affluent area and has been referred to as “magnificent Marvin.” The median income is about $168,000 and an average household income is close to $200,000. Marvin’s growth can be considered nothing but amazing with almost a 1,500% increase in population since 1990 and where over 60% of homes were built since 2000. Home prices in Marvin are amongst the most expensive in the Charlotte metro area and in North Carolina. Covering only some six square miles, Marvin is considered one of Charlotte metro area’s most exclusive and expensive, offering an abundance of custom, luxury homes on large lots. Zoning is quite restrictive to keep the feel of a peaceful, rural setting. The 27-acre Marvin Efird Park offers Marvin residents a playground, walking trails, picnic areas, community garden. It hosts community events such as the annual holiday tree lighting, national night out, and movie nights under the stars. Marvin’s location is second to none: Blakeney Shopping Center and Stonecrest Shopping Center are just over five miles away in the Ballantyne area. SouthPark Mall is 13 miles away, and Carolina Place in Pineville is eight miles away. Marvin is convenient to I-485 providing great accessibility to all of the Charlotte metro area’s commercial, dining, and shopping venues. 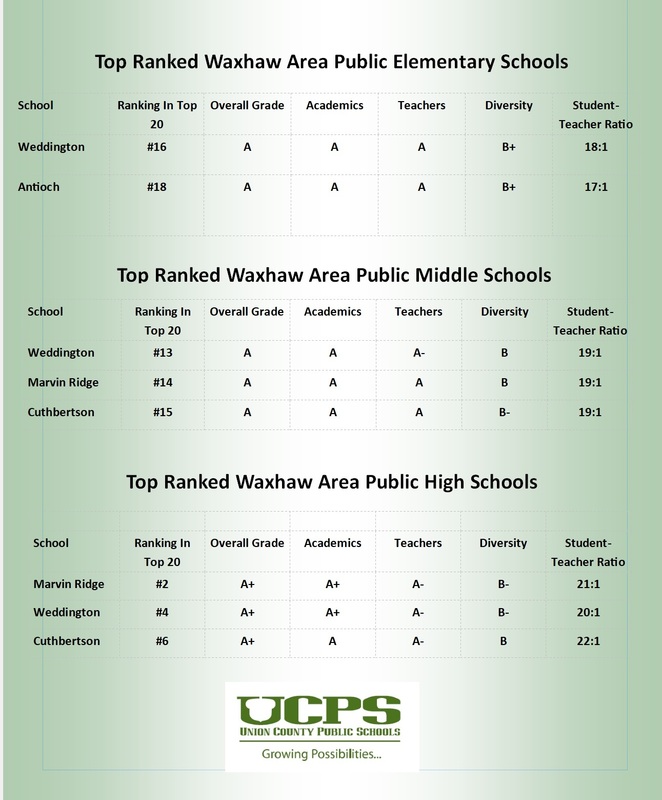 The Union County Public Schools district and the Waxhaw/Weddington/Marvin schools, particularly, have been ranked highly both in North Carolina and in the Charlotte region by Niche.com in their 2019 rankings. Union County Public Schools system was ranked the #3 best school district of 116 in North Carolina, with an overall grade of A-. UCPS has 31 elementary schools, 19 of which received a grade of A- or better. Five of the 10 middle schools in the Union County Public School system received a grade of A- or better. Four of the Union County Public School system’s high schools received a grade of A+, one a grade of A, and one a grade of A-. The Union County Public Schools system serves just over 42,000 students in its 52 schools; has a student-teacher ratio that averages 17:1; and a 93% graduation rate. Your real estate agent is the best source of information about the local community and real estate topics. Give Nina Hollander a call today at 704-779-0813 to learn more about local areas, discuss selling a house, or tour available homes for sale in Waxhaw, Weddington, Marvin. She’s been opening doors for Waxhaw, Weddington, and Marvin area home buyers and sellers for 20+ years. Experience the difference you can count on with Nina. You’ll be glad you did!